The fun dining room of our hotel. I have to snicker at this visual; my crack camerawork makes it look like Matthew is getting bonked on the head by a leftover piece of factory machinery. Our extended V-Day weekend began with a crack-of-dawn flight to Brussels. 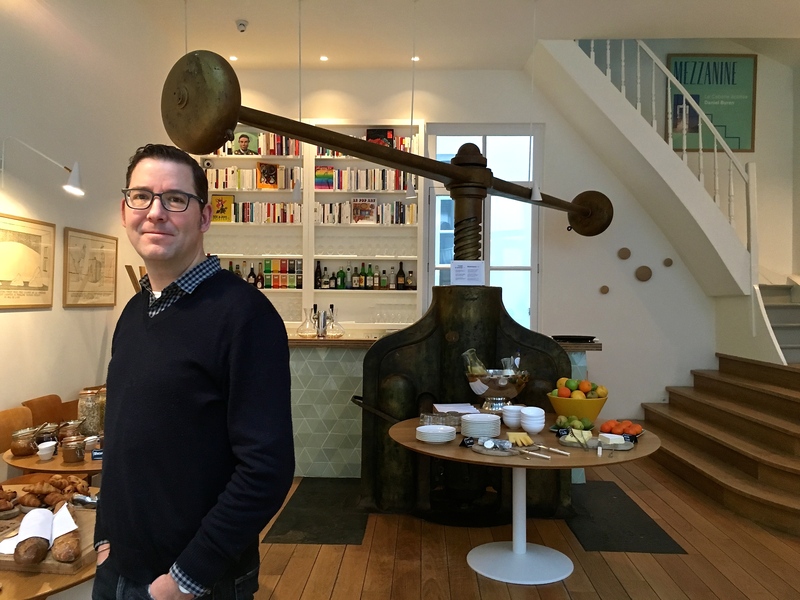 After a brief nap at the hipster Hotel des Galeries (beautiful, comfy, affordable, and smack dab in the middle of everything), we headed out to tackle our wish list of sights to see. I’ll be honest. We barely checked off a single item. The city’s allure kept beguiling us into its quiet cobblestone backstreets for better views of coquettish Art Nouveau architecture and Gothic grande dames. Every corner introduced us to more Medieval monuments and modern marvels. Valentine’s Day in the Lower Town. A fun and modern “beehive” building. The Art Nouveau Museum of Musical Instruments was once the Old England Department store. The interior finishes of an Art Nouveau building. A beautiful Art Nouveau tile-work floor. The variety came as quite a surprise to Matthew. He’s been to Brussels on business several times, but as usual with work trips, his touring was limited to conference rooms and quick walks through the urban center. His initial impression had been of a capital devoted to office towers oriented around the EU and NATO headquarters. So getting to see the full grace of the city, laid out in all her glory, came as a welcome relief for him. Our hotel stood steps away from the glass-covered Galeries Royales Saint-Hubert. Built in 1847, it’s Europe’s oldest shopping mall still in operation. Its greenhouse-conservatory style influenced similar shopping galleries in Paris, London, and other cities. 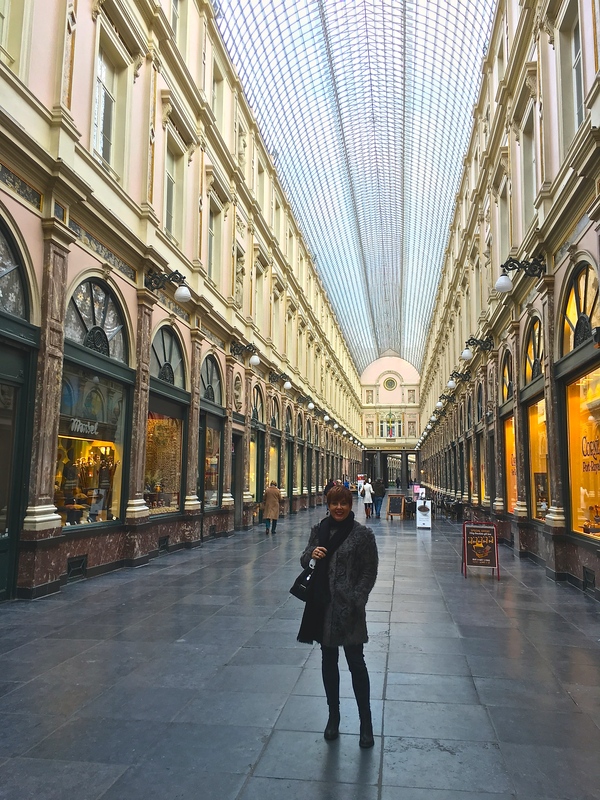 After ambling through side streets chockablock with an encyclopedia of architectural styles — and after spending some quality time drooling over pricey goods offered in the windows of exclusive shops that line Brussels’ gorgeous glass galleries — we finally decided to get serious about our tourism. Out came the Rick Steves’ guidebook. Taking his Grand Place Walk, we headed for the heart of Lower Town. A view of the Grand Place (Grote Markt) during the daytime. Matthew had stumbled upon this famous square in his previous wanderings and had prepped me for its grandiosity. But my jaw still dropped. 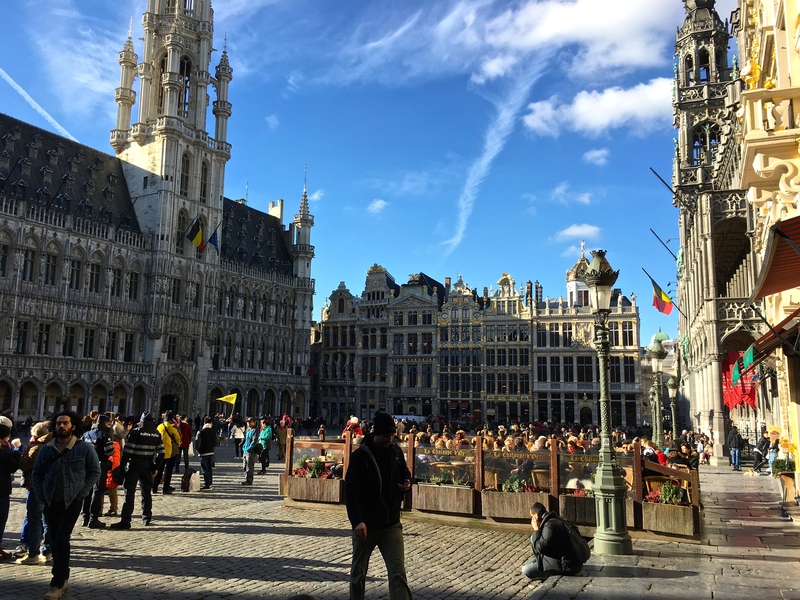 No amount of descriptions, photos, or Rick Steves’ videos can convey the overwhelming splendor of the Grand Place. Decked out in delicate gothic spires, lacy tracery, and gilded ornamentation, the buildings resemble nothing so much as resplendent courtiers and ladies-in-waiting, all lined up to begin a a stately square dance. Although they’re meant to be Valentine’s-Day festive, the eerie red lights give the square a sort of hellish “Dante’s Inferno” feel. The Grote Markt (Great Market), as it’s also known, has been a marketplace for more than 1,000 years. Souvenir stalls, lacemakers, restaurants, beer halls, and chocolate shops still surround the square. But it doesn’t feel kitschy or cheap. It’s frankly the most majestic tourist trap I’ve ever been in. We found ourselves circling back here throughout the day to photograph it in different light. 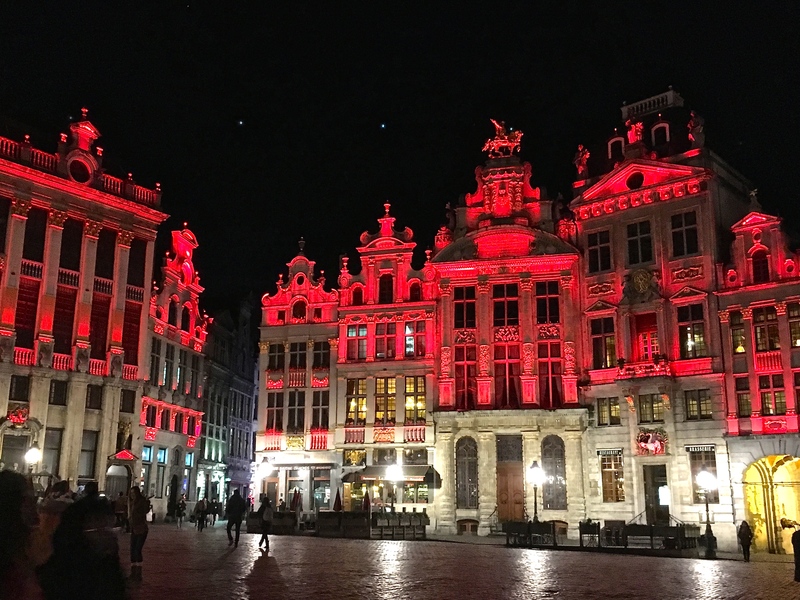 Nighttime proved particularly spectacular, as all the buildings were illuminated by red spotlights in celebration of St. Valentine’s Day, who should be the city’s patron saint considering it’s love affair with chocolate. One end of the Grand Place is formed by a gilded series of guild halls that were once offices for different trades, like brewers, bakers, etc. Built originally in Medieval times, they were rebuilt in 1695 after French King Louis XIV blew them to pieces while trying to take over the town. A closeup of the prickly gothic statues on the facade of the Town Hall, situated along one side of the square. Belgium’s Crown Prince Philippe got married here in 1999. The King’s House (Maison du Roi), once used by the Hapsburgs, was rebuilt in the 1890s. Love the little details like this windmill scene. I’m convinced that Brussels is the architectural love child of Paris and Amsterdam. The Swan House holds one of Brussels’ most expensive restaurants, which was once a bar where Karl Marx and Friedrich Engels met to write their Communist Manifesto. Wonder how they’d like the upgraded space now? My favorite building houses Parisian confectioner Ladurée. Its huge windows and fanciful cupid details made it look like a cellophane-wrapped box of fancy chocolates. A chocolate pyramid of hearts crafted by Pierre Marcoline was just one of the holiday offerings. We also sampled the wares of Godiva, Neuhaus, Galler, and Leonidas Chocolatiers. After all, we didn’t want anyone to feel left out. More gorgeous guild halls. Proud business owners rebuilt them in just seven years after King Louis XIV destroyed them. For some reason I thought it was funny to feign catching a drink from the squirting little guy. Usually he sports an odd outfit made for him by various EU nations. But today he went commando. 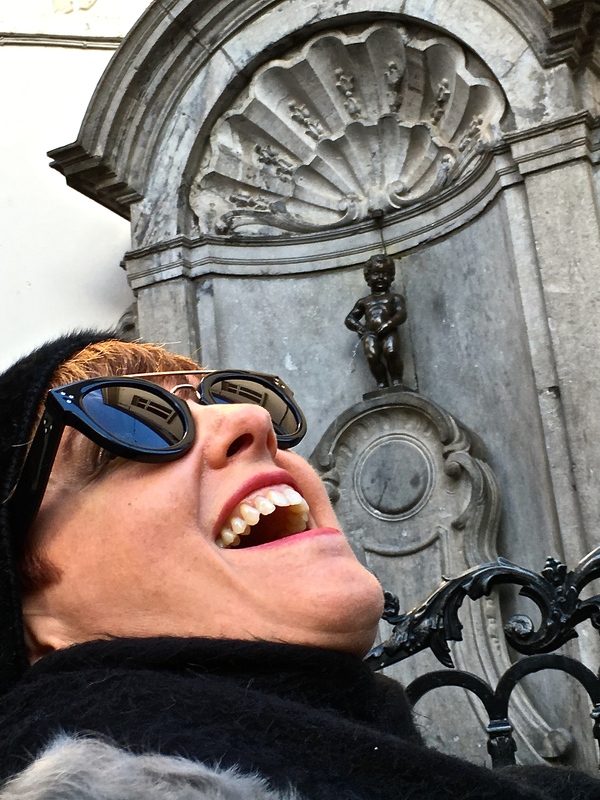 Heading away from the Grand Place, we paid our respects to the Manneken-Pis. Yep, you guessed it. It’s a fountain featuring a tiny statue of a peeing cupid. And it’s a must-see for every tour group. I’m not quite sure what the fuss is all about. Maybe folks can relate, having personally experienced the amount of excreting one must endure after a long night of drinking Belgian beer. Anyway, we eventually found our way to the Parc de Bruxelles, where we enjoyed fabulous views out over the city and garden. And of course we had to stop and partake of our first true Belgian waffle from one of the ubiquitous gaufre (waffle) stands. Mmmm, good. Parc de Bruxelles spreads out behind us. Then with a scant hour left of the workday, we made a beeline for the Magritte Museum. I’ll confess that I’ve never been a huge fan of surreal art. Much of it is often just a little too simplistic and “one-liner-ish” for me. But I will say that the museum did a great job of tracing the evolution of Magritte’s goal: To question how we perceive and portray objects and imbue them with our own psychological prejudices. The poster features the typical double-entendres often found in surrealist art. René Magritte poses next to his self-portrait. My own little attempt at surrealism using the products in the museum store window. One of his “Empire of Lights” paintings, which hint at the almost ominous air of quiet suburbia. Magritte’s early life was spent as a commercial artist, which gives his work a sort of graphic magazine-ad quality. He aimed to question our perceptions of reality, challenging us to find mystery hidden in the commonplace. Called “Treasure Island,” the painting reflects Magritte’s anxiety and longing to be free during the Nazi occupation of Belgium. Matthew enjoys a Morte Subite Blanche lambic after passing me the kriek, which he claimed tasted too much like Robitussin cough syrup. At this point, we’d delayed our seafood intake long enough, so we headed to Brasserie Taverne du Passage for their fantastic shrimp croquettes (the best we had in Belgium), mussels in white wine (also fabulous), and vol-au-vent (okay, so that last one is a chicken-filled pastry, but it beckoned to me.) Then it was time for Belgian beer. 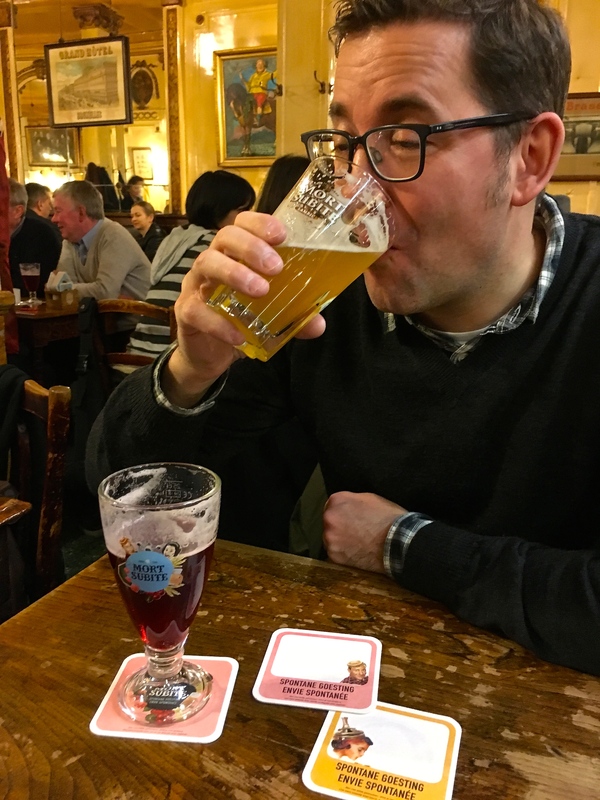 We bellied up to one of the crowded, bar-like tables at A La Mort Subite to try the kriek (a cherry-flavored brew) and the Morte Subite (“Sudden Death”). Both are lambics, beer that has been fermented for years in wooden casks using wild yeasts from the sea air. After a few tankards of these, and a later trip to Delirium Tremens to try their heavy hitting brew (8.5% alcohol), let’s just say, we slept well that night. 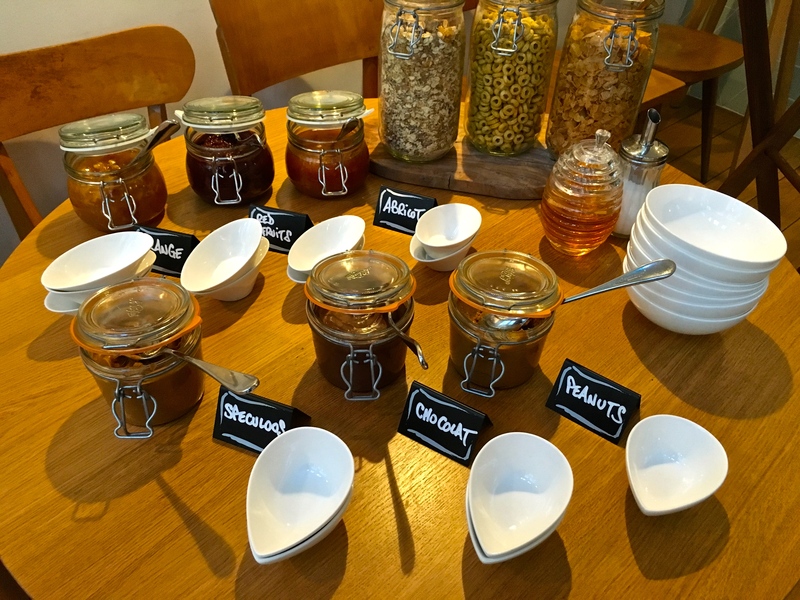 The amazing array of condiments in the breakfast bar at our hotel. The speculoos (front row, left) has a consistency like peanut butter and is made of vanilla, cinnamon, pepper, ginger, nutmeg, and cardamon. The next morning, we grabbed a delicious breakfast at our hotel. I made a meal out of hand-made goat cheese and butter, each in its own little paper wrapper, plus awesome coffee that proved much better than the odd, fake-creamer stuff we’d purchased at street-side cafes. (Belgium isn’t known for great coffee.) And I tried some speculoos, a treat that I’d seen featured as a filling in chocolate, as a topping on cookies, and as a spread. I’d been pretty dubious about its appeal, because the name reminded me of a piece of gynecological equipment, but it was delicious, tasting like creamy gingerbread. 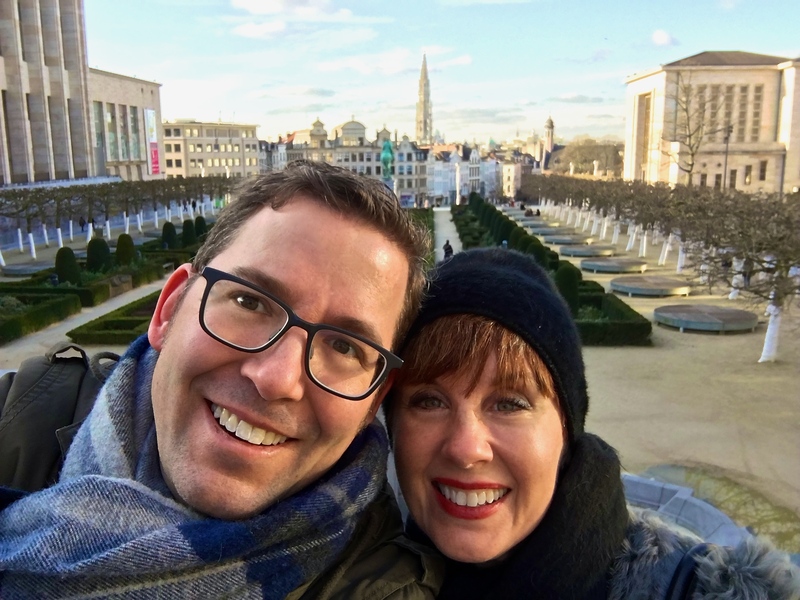 As we headed to the train station for our next destination, we acknowledged that we’d only scratched the surface in Brussels. No doubt we’ll need to make another trip to this gorgeous city (providing terrorism leaves it intact.) Our next stop? Bruges.